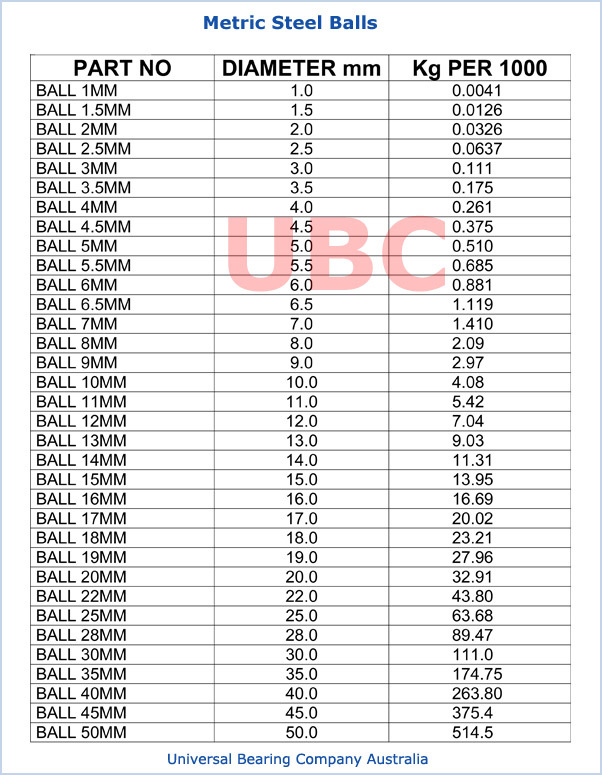 Metric Steel Balls Materials Steel Universal Bearings Company UBC (chrome carbon stainless) brass tungsten carbide bronze aluminum balls... The synthetic ball line includes Delrin Nylon PP PE PUR PTFE acetal phenolic resin polyester polystyrene elastomers (e.g. PUR Torlon EPDM) NBR SBR ceramic glass. Diameters - tolerances The full line is available in both imperial and metric sizes to AFBMA or DIN 5401 tolerances. Types: Full or hollow balls floating abrasive or magnetic balls coated coloured or transparent balls. Finishing: Ground polished drilled balls; engraved or silk-screened ball Applications: Pumps sprays aerosol cans agitators sliding systems bearings grinding polishing valves cosmetic decoration tracks.